Carrot Cake Trifle with Cream Cheese Frosting - THE OLIVE BLOGGER - Recipes your family will love! Omg this looks amazing! I always make trifles but I’ve NEVER made a carrot cake one! How yummy! Pinning! Thanks so much Apryl! It really is a showstopper dessert, and it is so so yummy!!! So simple and so pretty! I love the idea of adding the candied walnuts, too. Keeping this one for Easter. Thanks for sharing! You are so welcome Meredith, I hope you enjoy it as much as we all did!! O my! That looks seriously delicious! Thanks for sharing this treat!! Oh wow this looks SO good! This would be something my dad would love too, as carrot cake is one of his faves! I might have to try this sometime! Father’s day maybe? Pretty dessert! 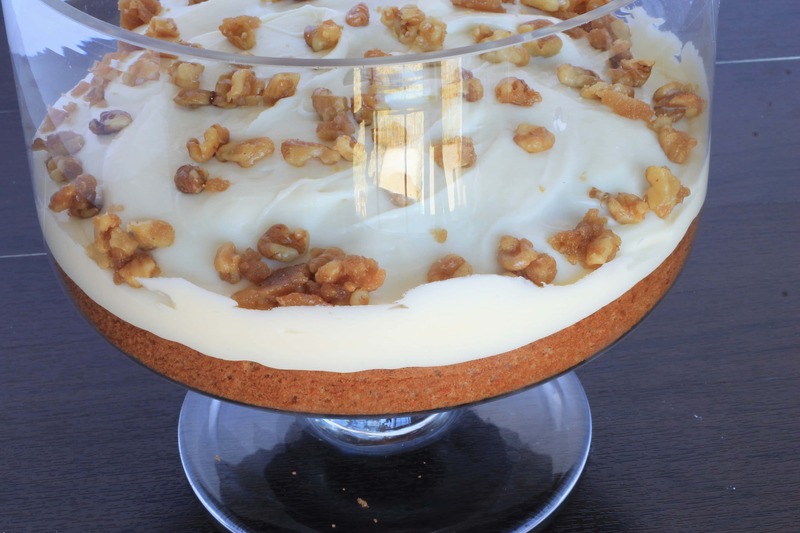 I’m a BIG fan of carrot cake, but carrot cake trifle sounds even better! What a cute idea. It looks so pretty in the trifle bowl. And those candied walnuts, yum! Isn’t nice to change it up a little?! I love taking classics and putting a twist on them for everyone to enjoy! A nice creative twist on a favourite – I love carrot cake so this is a must-try for me. If you have a homemade recipe you love to make you can do it with that, we just used boxed cake to make it simple and quick! Enjoy!